Apple Thoughts: Which Smartphone Operating System do You Prefer? Which Smartphone Operating System do You Prefer? "In a recent report from Nielsen, Google snagged 40 percent of the smartphone market, while Apple captured approximately 28 percent -- up just barely .01 percentage point from last year." The only thing that surprises me about this is that there are so many that desire RIM for their next smartphone operating system. 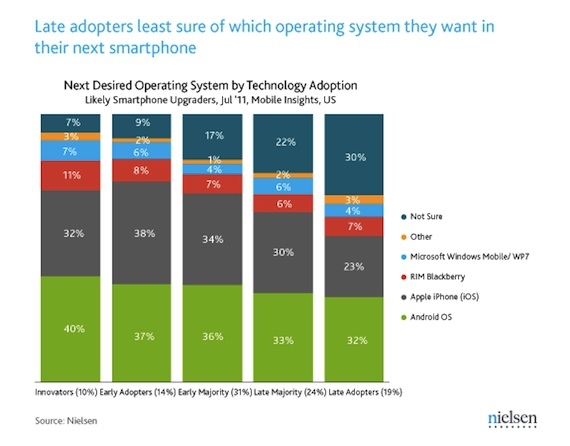 Maybe that and the fact that 30% of the late adopters aren't sure what they want. You would think that with all of the information out there, this percentage wouldn't be as high.